Hey F’ing Monkey, what is best in life? That’s right! What if I want to tell the rest if the world? 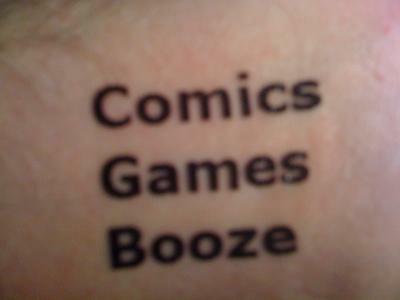 Oh, tattoos? That’s awesome. 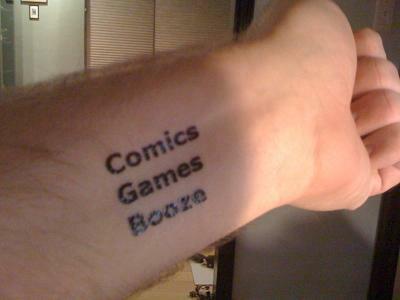 But what if I don’t want it on my body forever? They’re temporary? That’s even better. Yup. That F’ing Monkey now has temporary tattoos. Well a test run of them anyway. Anyone who really wants one now should hit the contact us button. Supplies are very limited. Use it as a shopping list. Use it as a personal mantra, motto, spiritual guidance, or mission statement. This is just some fun self promotion everyone. Testing the merchandise waters if you know what I mean. 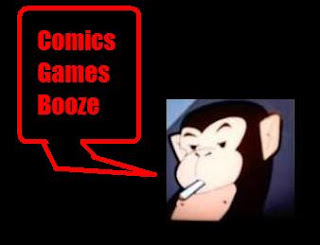 Remember kids, when you think Comics, Games, Booze; think That F’ing Monkey.